Mermaid and Sea Glass Art! I’ve been having a great time playing with my sea glass in a new way. While I truly enjoy creating lovely sea glass jewelry I have found another fun way to use my sea glass by creating sea glass art! 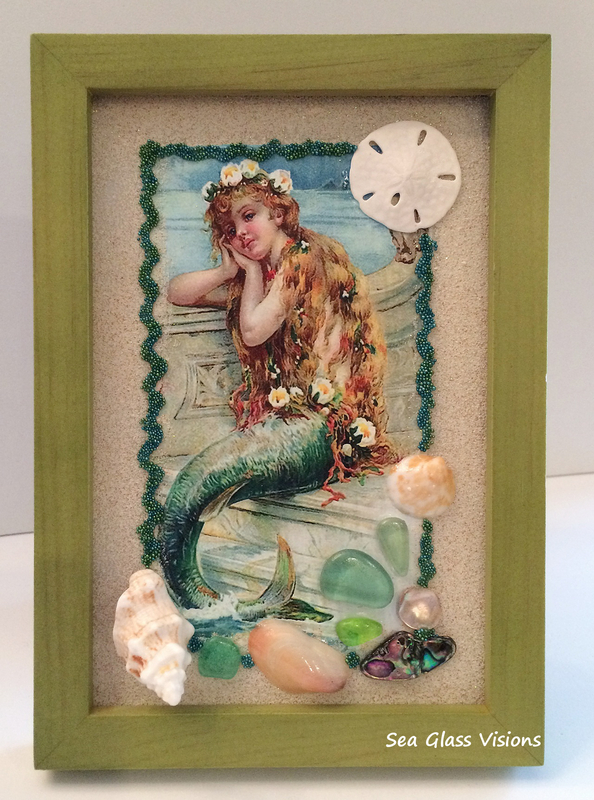 I created a lovely Mermaid art piece in a picture frame. This lovely Mermaid has special meaning for me too. When I was a child I was given a book of Hans Christian Anderson fairy tales. This picture was the picture in the book that accompanied the story “The Little Mermaid”. Along with the sea glass I used a variety of sea shells found by me on the Caribbean island of Anguilla as well as sand a lovely sand dollar that was found by me in the Bahamas! This entry was posted in Creating With Sea Glass, Sea Glass Art by Cathy. Bookmark the permalink.